I dream so much and live so little that I’m sometimes only three years old. But the next day I’m three hundred, if the dream has been somber. Isn’t it the same with you? Doesn’t it occasionally seem to you as if you’re starting out on life without even knowing what it is, while at other times you feel weighted down by thousands of centuries of which you have but a dim and painful memory? Where do we come from, and where are we going? Anything’s possible because everything’s unknown. I “met” George Sand when I was twelve years old. In the county library, I noticed a book called Infamous Woman (I’ve always had a soft spot for infamy); I read the book, a biography of Sand, and became infatuated with her. My infatuation has lasted decades and has morphed from fascination with Sand’s personal life to deep appreciation of her ideas and writing. Sand was a writer of amazing stamina, producing a huge body of work: 70 novels and novellas, two dozen plays, essays galore, decades of daily diary entries, and 25 volumes of correspondence (each volume around 1,000 pages! )2 I’ve enjoyed many of her novels, but my favorite Sand works are autobiographical, personal — History of My Life/Histoire de ma vie (started when she was 43 and, at completion, comprising five volumes), A Winter in Majorca/Un hiver à Majorque (about a nightmare “vacation” with Frédéric Chopin) and Lettres d’un voyageur (musings on her travels, love life). I start every new year re-reading some of my favorite books, a comforting mental re-boot of sorts; this January finds me reading the amusing, affectionate, sometimes combative correspondence between Gustave Flaubert and Sand. Maybe the clue to George,3 the first perfume by Jardins d’Écrivains, is the fact that Sand loved botany and gardened with gusto at her country home, Nohant (represented by a Jardins d’Écrivains candle); she had an abiding interest in plants — collecting specimens to grow, research and preserve. On first sniff, I realized George is, perhaps, not an homage to Sand’s flower or vegetable beds, but to indoor “cultivation” — reading/studying, pressing flowers, leaves and stems, and carefully placing dried plants into large-format books for preservation. George opens with a dark, “polished” vibe; it’s heavy on delicious-smelling Peru balsam and myrrh; these notes, along with citrus, conjure a dim, shuttered study, full of books. There’s a soupçon of an acidic/sharp aroma one sometimes detects in old papers…and dried plants…and in hawthorn, which reminded me of a Henry James quote; he said Sand’s written language "had to the end an odor of the hawthorn and the wild honeysuckle".4 I also detect aromas of waxed wood paneling and floors, and lit beeswax candles — with their whiff of honey…and sweet smoke. As George develops, I smell “woody” black coffee beans, and a touch of sweet, natural-smelling tobacco (imagine a pinch of freshly cured tobacco taken from a leather pouch). Neroli and heliotrope do their work in the periphery…their scents drifting into my imagined study through open windows or Sand’s Eau de Cologne. At the end of George’s development, the rich notes turn “dusty”…providing a pungent powdery finish (the white musk in George is neither utilitarian, nor too sweet). Sand, as a young woman, sometimes dressed in men’s clothes and enjoyed smoking cigars and cigarettes her whole life; she was often referred to by contemporaries, including Elizabeth Barrett Browning and Ivan Turgenev, as “he” (Flaubert called her a “great man” and addressed her in his letters as chère maître, using the feminine adjective “dear” with the masculine noun “master”). 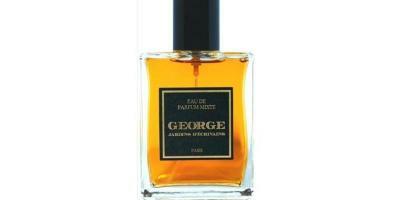 George Eau de Parfum is, appropriately, unisex (or “mixte” as Jardins d’Écrivains classifies it). Jardins D’Écrivains George is available at Beautyhabit, in 100 ml Eau de Parfum, $110. Recent additions to the Jardins d’Écrivains perfume line are Gigi (referencing the novel by Colette) and La Dame aux Camélias (based on Marie Duplessis, the lover of Alexandre Dumas fils, and the inspiration for his famous novel). 3. The fragrance notes include neroli, bergamot, heliotrope, coffee, tobacco, white musk, Peru balsam and myrrh. 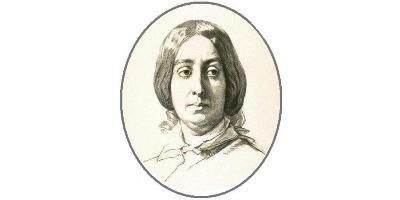 Note: top image George Sand via Wikimedia Commons. Great review! I’d love to give this a sniff…as long as it didn’t trigger an existential crisis. Sigh. I’m beginning to feel about fragrances as I do about books, which is that I wish everyone would just stop writing/publishing for a year or three so I could catch up. Ginny…we share wishes…but don’t think they’ll come true! One of my favorite movies – Impromptu – with Judy Davis as George Sand. Have you seen it? If not, I recommend it! Very fun. Hugh Grant as Chopin and Julian Sands as Liszt. Mandy Patinkin, Bernadette Peters, and Emma Thompson, too. Karin…yes, Judy Davis can do no wrong. Thank you. I wrote it. Stewpid, STEWPID rain! Impromptu is one of my favorite movies. This fragrance sounds lovely and I hope to try it some day. Relleric: ha! I hope you get to try it too. This sounds brilliant as does the Tolstoy candle (wormwood, leather, benzoin) but…*sigh* seemingly no UK stockists. Abyss, I do think you can order online…but that means you can’t pre-sniff. But i think i will have to order a candle myself. Abyss ~ Bloom in Spitalfields stocks this. They’ll probably do a sample for you if you ring them. I’ve been intrigued by this line… Do we know who the perfumer is for George, or for that matter, any of the Jardins d’Ecrivains line? Breathes…I’d like to know too. George Sand? Great review Kevin! Thank you. Peke, Sand is popular…MPG and Histoires de Parfums have scents dedicated to her. This is my favorite though…but want to retry HdP 1804. I didn’t care for that fragrance, it was really challenging – it veered toward leather and resin but then there was the overriding aroma of stable floor. Irisfreak: HAHA! That sounds right up my alley! But I remember it as a fruit salad perfume…pineapple and such. I REALLY need to retry it then. That’s the Histoire des Parfums pineapple one. GS would have barfed. The MPG was more difficult, and I just looked up the notes and of course there’s no leather in it so I’m really wondering what has happened to my olfactory memory. Maybe what I hated was the patchouli which seemed really manure-y in this one. Still, I don’t think either one conjured up ol’ George for me. But I’m going to Paris in April and will track down this new one. Wow, my favorite perfume for decades was Casaque, which was made either for or about George Sand, as she always wore a vest, like a man. Casaque was from Jean D’albret and is still a great perfume, altho discontinued. Jahn: Hadn’t heard of it! This sounds wonderful and your evocation of George Sand is prompting me to move George Sand to the top of my reread list! Fragrant: last weekend while writing this post I moved all my G. Sand books to the front of the bookcase…I’d like to re-read several this year too. Glad to see you recommending the best books on George Sand, esp the Curtis Cate, though when you get older the Flaubert-Sand one is rich in wisdom. Did you ever see “Impromptu” with Judy Davis? I’ll have to try this scent. Iris: another bio I liked was an OLD one, by Andre Maurois, “Lelia: The Life of George Sand”…don’t even know if that’s still in print in English…. Yes! I have that one still. My first was “The Lion and the Lamb” about her affair with Chopin – that’s what got me started on my Sand binge. This writers’ gardens line sounds like it was made for you, Kevin! George sounds great, and I definitely want to try it. I still don’t see your early interests as pretentious. I know it can be easy to feel that way when one grows up in a small-town environment without much to do (thank God for the library!) and no way to find others who share one’s cultural interests. Why wouldn’t you want to experience what this exciting and rebellious writer had done, and so what if making jam was the most feasible of her activities at that point? Noz: true enough! “Pretension” led me to some interesting places and experiences. I’m still a jam-making fiend, too. Very interesting article. I’ve been a fan of Geoge Sand since age of 12. Loved her book . I so enjoyed your article. And I’m such a sucker literary themes in perfume. Your review makes me want to test this one right away. The Histoires de Parfums homage to George Sand (1804) never seemed to fit her character:–too much pineapple. But I like the patchouli rich MPG Geroge Sand. The Jardins version sounds like an interpretation closer to that character interpretation: rich, a bit dusty, booksih, but blooming. I love that it is sold as mixte! Cheryl: thanks for that…Field Notes has been on my to-buy list for…years? I’ll retry the MPG GS before buying.